Researchers can now compare not only the genomes, but all the genes expressed, by domestic and wild tomatoes. You say tomato, I say comparative transcriptomics. 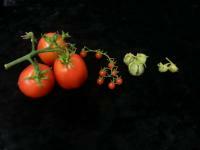 Researchers in the U.S., Europe and Japan have produced the first comparison of both the DNA sequences and which genes are active, or being transcribed, between the domestic tomato and its wild cousins. The results give insight into the genetic changes involved in domestication and may help with future efforts to breed new traits into tomato or other crops, said Julin Maloof, professor of plant biology in the College of Biological Sciences at the University of California, Davis. Maloof is senior author on the study, published June 24 in the journal Proceedings of the National Academy of Sciences. For example, breeding new traits into tomatoes often involves crossing them with wild relatives. The new study shows that a large block of genes from one species of wild tomato is present in domestic tomato, and has widespread, unexpected effects across the whole genome. Maloof and colleagues studied the domestic tomato, Solanum lycopersicum, and wild relatives S. pennellii, S. habrochaites and S. pimpinellifolium. Comparison of the plants' genomes shows the effects of evolutionary bottlenecks, Maloof noted -- for example at the original domestication in South America, and later when tomatoes were brought to Europe for cultivation. Among other findings, genes associated with fruit color showed rapid evolution among domesticated, red-fruited tomatoes and green-fruited wild relatives. And S. pennellii, which lives in desert habitats, had accelerated evolution in genes related to drought tolerance, heat and salinity. New technology is giving biologists the unprecedented ability to look at all the genes in an organism, not just a select handful. The researchers studied not just the plants' DNA but also the messenger RNA being transcribed from different genes. RNA transcription is the process that transforms information in genes into action. If the DNA sequence is the list of parts for making a tomato plant, the messenger RNA transcripts are the step-by-step instructions. Gene-expression profiling, combined with an understanding of the plants' biology, allows researchers to understand how genes interact to create complex phenotypes, said Neelima Sinha, professor of plant biology at UC Davis and co-author on the paper. "Genomics has fast-tracked previous gene-by-gene analyses that took us years to complete," she said. "We could not have done a study like this ten years ago -- certainly not on any kind of reasonable budget," Maloof said. "It opens up a lot of new things we can do as plant scientists." Page took 0.022043 seconds to load.